Pay the Piper by Jane Yolen, Adam Stemple. Shelby and the Shifting Rings by A. M. Veillon. This week we take a look at the younger side of writing. 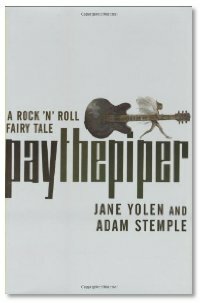 First up is Jane Yolen and her latest book, Pay the Piper: A Rock-n-Roll Fairy Tale. She wrote it with her son Adam Stemple and we discus the wonders of teen writing. Next up is A. M. Veillon and her book for younger readers, Shelby and the Shifting Rings. We get to delve into the writers mind for a few minutes. Don't miss it. The dragon is full this week, so instead we bring you Eric Marin of Lone Star Stories. A small publisher bringing you poetry and interesting tales that you can't find anywhere else. Check them out when you have a moment. Friends don't let friends game drunk??? Wait... you did go to DragonCon... Right? Wait, so the Podcasting Panel at CopperCon will only be one hour on Friday? I don't get out of work until 4! Geez. More importantly, where will you guys be drinking after? Where are we drinking beer afterward? Now that is a true fan of the show. I would expect that we will be in the Con Bar in the main area, but that may change. Michael Stackpole, Tee Morris, Evo and Michael have to run to a book signing in Scottsdale after the panel, but there may be time for one or two before we head out. Don't worry too much john... I'm sure someone will be recording the podcasting panel... right guys? Actually, I made it! I was the guy in the Batman shirt. Maybe you found me in the crowds of people in the Podcasting panel. Good panel guys. Even if it was held in a room hotter then Satan's Sauna.